15 Best Maang Tikka and Matha Patti Looks Of 2017 - #Weddingz2017Rewind! From completely traditional, gold embellishments, to tassels and artsy florals - maang tikkas and matha pattis were a crucial part of the whole bridal shringar in 2017. Maang tikka, matha patti, passa or head chain, it goes by many names, types and shapes and is a significant part of your bridal look as it gives definition to your face. We at weddingz.in are all about inspiration, and we have said it time and again that 2017 saw some really great weddings with brides opting for some really stunning looks. 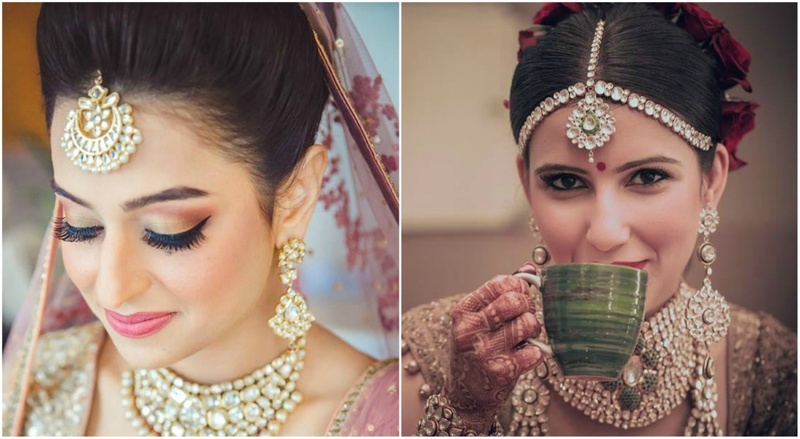 After our best Wedding lehengas, bridal makeup, cocktail outfits , best mehendi outfits and best bridal hairstyles articles of 2017, we are now doing a roundup of best maang tikkas we spotted on real brides in 2017. This one’s a classic and has been a favourite over the years. This design was worn by a lot of brides in 2017 making it one of the most popular choice. The design mostly consists of pretty pearl and polki accents adding a lot of elegance to your bridal look. A traditional adornment from the Marwari community, this stunning spherical maang tikka is usually crafted in meenakari with stones and diamonds. We believe a borla brings a touch of royalty to the Rajput bride. Anushka Sharma and Bipasha Basu, both wore an elaborate uncut diamond matha patti from Sabyasachi and looked their most stunning selves. Their matha patti with intricate work was a sight for the sore eyes making it a Bollywood favourite of 2017! This one is a slight variation to the ones above, in this one even the middle strand has an elaborate design on it. The traditional ornament of the Muslim/Sikh bride, a jhoomar or passa is worn along with the maang tikka on the left side of the head, elevating their look to royalty. Kundan is an age old tradition for bridal sringar. These gorgeous maang tikkas, crusted with uncut diamonds add the perfect touch of elegance to your wedding look! Floral maang tikkas have been trending for a long time now, with brides wearing real or artificial flowers in it. They are a perfect choice for your pre wedding ceremonies like haldi & mehndi. We love this bride’s single floral tikka for her pre wedding functions. If you are a minimalist bride, then you’re surely going to love this bride’s minimal maang tikka. With just a little touch of tradition, these petite maang tikkas work wonders for the bride who want to keep it simple. These very trendy matha pattis with a single strand and a ajna chakra make for really pretty stunning maang tikkas! Slightly more luxe than the single-string one, this double-stranded maang tikka sits across the bride’s forehead making her look regal! We love how this multiple stranded maang tikka gracefully encircles the crown of the bride’s head making her look phenomenal. If diamonds are this bride’s best friend, this uber-chic maang tikka brings diamonds and rubies or emeralds or sapphires together making the bride look gorgeous! Sasha Rawal’s majestic Mughal inspired maang tikka from the skilled hands of a gifted kaarigar featuring an intricate design studded with polki and beads is a stunner in itself. This one sure marks it’s way to our honourable designs section, making it the most elaborate matha patti seen on a real bride in 2017. Nothing but pure gold; this absolutely straight-up, pendant maang tikka is elegant and timeless! We hope this curated list of best maang tikkas spotted on real brides in 2017 helps you decide which one you wanna opt for your 2018 wedding. An elaborate maang tikka to an understated mathapatti, whichever you decide to pick, just make sure it brings elegance to your look.